Certain days are easy to remember. Thanksgiving is the fourth Thursday in November, and Mother’s Day is the second Sunday in May. For my family, there’s another annual occurrence penned in our family calendar for the Sunday before Thanksgiving–The Apple Pie Auction & Variety Show. First Presbyterian of Lancaster—our family church—hosts the evening in the spirit of fun and fellowship, but also to raise funds for the youth group’s summer mission trips. The concept is quite clever. Auction off pies baked by the youth group and other church members after a family-friendly meal of chicken corn soup and hot dogs. A variety of musical performances, comedy routines, and skits are interspersed between the pie sales. Highlights include a professional-caliber piano performance by a mother-son duo as well as a funny wordplay masterminded by the same boy and a long-time church member. For the sake of a good cause and consistently delicious offerings, the price of each pie always far exceeds the cost of ingredients. Seasonal demand, of course, creates added value. The freshly baked pies are needed on many a Thanksgiving table several days later. While the auction includes plenty of apple, pumpkin, and pecan pies, a handful of the pie tins contain non-traditional recipes. One year, I donated several baked oatmeals—perfect for a holiday breakfast—and, this year, Aunt Glenna’s Flourless Fudge Pie will be on the docket. Aunt Glenna was the paternal aunt of Martha Barry, a long-time church member and dear family friend. Martha treated my family to one of these decadent pies a few months ago, and my kids and their friends promptly devoured it. I have made her recipe several times since, always to rave reviews. The dessert can best be described as a middle ground between a traditional flourless chocolate cake and a fudgy brownie. The texture is dense but in a creamy sort of way, and the top bakes up with a hint of crustiness. The preparation is basically easy but does include one fussy step–whipping egg whites. One time during the process of trouble-shooting the recipe, I made the mistake that one aims to avoid in this process. I over-whipped the whites. The result was big cracks on the top of the pie, but the taste was still terrific. I’ve included extra tips below to ensure success, but this blunder reminded me of my friend Lisa’s quick-thinking solution to a cake that stuck fast to the pan as she was attempting to serve company. She piled the crumbled pieces of otherwise delicious cake into pretty glasses, layering with a little whipped cream, and called them parfaits! The technique of whipping eggs whites and folding them into a batter serves to lighten the batter of the dessert that is about to be baked. It’s really very easy, and a few basic tips will ensure success. Eggs will separate more easily when cold, but egg whites that have sat at room temperature for approximately 30 minutes will achieve the fullest volume. Fresh eggs will reach the fullest volume when beating. Make sure there is no trace of yolk in the whites and that bowls and beaters are very clean and completely dry. To avoid getting any bits of yolk in the whites, separate the whites into a small bowl or ramekin and then transfer one at a time to the bowl in which they will be beaten. Beat the eggs at slow speed until they are foamy and gradually increase the speed to medium-high for a high-powered stand mixer or high for a handheld mixer. The eggs will become foamy first, and then reach the soft peak stage. At this stage, when the beater is lifted, there will literally be a soft peak that slumps over. Once firm peaks are achieved, the peaks will stand tall and not bend over. The presence of sugar will create a glossy appearance. The sugar in a recipe should be added when the soft peak stage has been reached. Add gradually. Once the firm peak stage is reached, stop beating. Once overbeaten the whites will become dry and clump together. They will break down in the batter and not lighten the cake as intended. After reaching soft peaks, I like to stop the mixer frequently to check the whites. Don’t let the beaten egg whites sit. Use them right away. When folding the whites into the batter, start with about a third of the egg whites. This will lighten the batter and prepare it for the remaining whites. Using a rubber spatula, plunge the “sharp” side of the spatula into the middle of the bowl, and pull toward you with the flat side, bringing a portion of batter up as you go. Rotate the bowl as you repeat the movement, always starting at the center and pulling the batter up along the side of the bowl, until the batter is more or less homogenous. If you see a few wispy streaks of egg white, that’s okay. This process will create as little deflation of the whites as possible. Yields 1 pie (approximately 12 servings). When separating the eggs, place the yolks in a large mixing bowl and the whites in the bowl of a stand mixer (or another mixing bowl if using a handheld mixer). Whisk the vanilla into the egg YOLKS, and set aside. Melt the chocolate and butter in a heavy saucepan over low heat, stirring until smooth. Gradually stir the melted chocolate mixture into the yolk mixture (I do it in 3 to 4 globs), and whisk until blended. This mixture will be fairly thick. Beat the egg whites at low speed until foamy. Slowly increase the speed to medium-high to high and beat until soft peaks form. At this point, gradually add the sugar, and beat until stiffer peaks form. (Tip: When in doubt, err on the side of softer peaks to avoid overbeating. 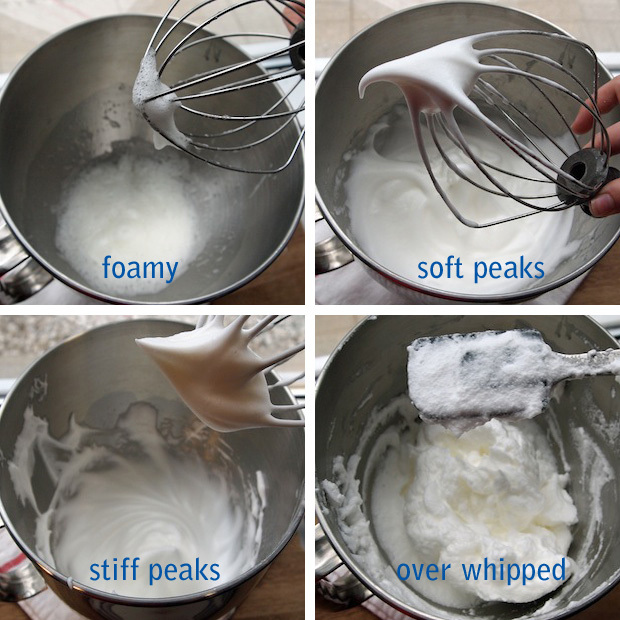 If your peaks look fluffy and hold their shape, they’re good.) 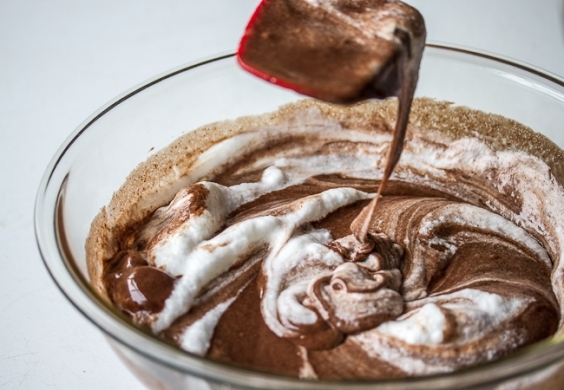 Gradually fold the beaten egg whites into the chocolate mixture until the ingredients are just blended. (Again, I do it in 3 to 4 additions.) Pour the mixture into the prepared pie plate. Bake for 25-35 minutes, depending on the chosen pie dish, until the pie is just cooked through the center, being careful not to over bake. (Like brownies, you may prefer the slightest hint of an under-baked center, but it shouldn’t be jiggly.) Drape with a piece of aluminum foil if the edges are turning dark before the pie is done. The pie may crack on the top and will sink some when cooling; this is normal. Let the pie cool. Store, covered, at room temperature for 5 to 7 days. For a pretty look, dust with powdered sugar prior to serving, if desired. Serve with whipped cream or ice cream. The flavor of this pie continues to improve over several days making it an ideal recipe to prepare in advance. The first time I made this pie, I slightly overbeat the egg whites. The pie was slightly crumbly but still moist and delicious. Whipped cream or ice cream will cover most mistakes, but if this happens to you and you’re unhappy with the appearance, simply serve the pie as a parfait with layers of whipped cream in pretty glasses. When Martha makes this pie, she covers the bottom of the greased pie dish with toasted, salted and chopped pecans but notes that this can be substituted with just about anything—shredded coconut, peanut butter chips, coarsely crushed cookies, etc.—or omitted altogether. I was reading today’s paper, Ann, and began reading your column, as usual. Fudge Pie – one of my favorites, haven’t had it in years. Apple Pie Talent Show – loved going to that when my kids were at home. Aunt Glenna – so Ann has an Aunt Glenna. Interesting, since it’s such an unusual name. No, it’s Martha Barry’s Aunt Glenna . . .
which would be MY MOTHER! And I’m laughing. PS: My family lived within walking distance of Fountain Avenue so it must be something in the water. Thanks so much for taking the time to share your comment, Rachel. I brought such a smile to my face. We have so enjoyed this treat and the small piece of history shared by Martha. One great comment she made when she was over… She said, “I’ve been thinking about this. Aunt Glenna used to invited our whole family over for dinner. There were FIVE kids in our family. WHO invites a family of seven over for dinner?” She said it with such fondness. Made this for dessert last night. It was wonderful! So glad you enjoyed. Thanks for the feedback, Jackie! Waiting patiently to have a piece today (trying to show some restraint) we love it! Being a gluten free person, I think this looks delicious. 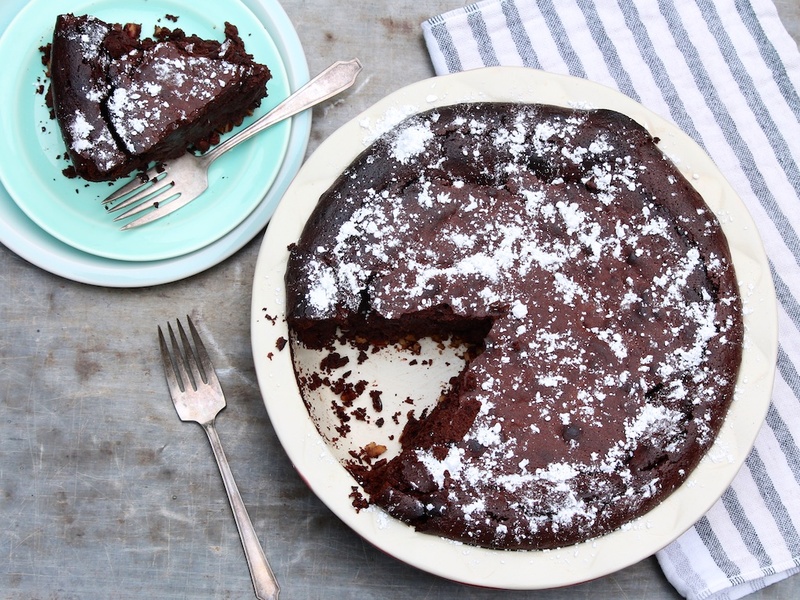 Was wondering…does the texture of the pie come out more like a brownie or pudding like? The best way to describe it, Aimee, is like a slightly creamy brownie. It’s dense but not as much as a traditional flourless chocolate cake and especially delicious with a small scoop of vanilla ice cream. I hope that helps! The verdict is in. It’s DELICIOUS!!!! It was surprisingly fluffy considering there is no flour involved. Wow! I will surely be making this in the future for my GF friends. So so good! Hands down on the easiest recipes I have made that was flourless and that turned out to taste sinful. Such great feedback…thank you for taking the time to comment, Misty. I’m thrilled this was a success! This sounds wonderful. My husband loves dessert & I think he’d love this for Christmas. I think I’ll try it with coffee ice cream. Thanks for the recipe. A scoop of coffee ice cream would be delicious with this, Deb. Enjoy! Thank you for your wonderful comment! It’s a pleasure to hear from Aunt Glenna’s namesake. I hope she’s smiling from above as people enjoy her masterpiece! Hi Ann, Made this using 1/4 granulated Splenda instead of sugar. Tasted great and my family wasn’t even aware of the switch. Great to know, Deb. So glad that worked and thank you for taking the time to mention it here! 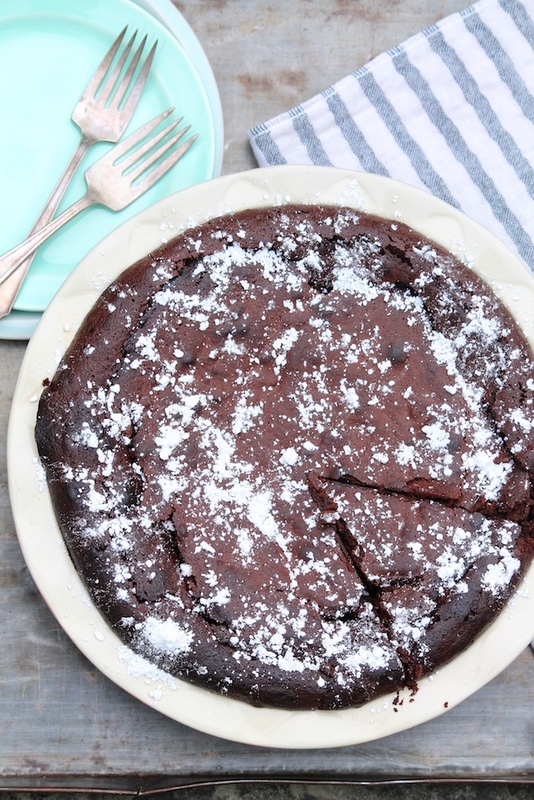 This is my absolute favorite recipe for a flourless chocolate pie. I only reserve it for very special occasions and have still managed to make it five (!!) times (a record for me). Thank you for sharing it with us. This time, however, I wanted to try a white chocolate variation of this recipe. Would it significantly alter the taste (beyond the obvious) or texture, do you think? I’m thrilled that this has become a favorite, Shraddha! As for your question, I love the idea but am not sure enough to recommend it. White chocolate doesn’t contain any cocoa solids–it’s just sugar, milk, and a small quantity of cocoa butter, so the texture could be different. You’d likely want to reduce the sugar. If you decide to experiment, I’d love to know how you make out!